I heard about this book a long time ago on Amazon and my curiosity was piqued, but I wasn't exactly motivated to read the book until I saw it at my local library. It looked like a really cute and dark short read that would entertain me. For some reason, I didn't really find Violet to be very remarkable. I did enjoy her jokes, some of them that probably shouldn't be funny because they were about the dead, but they were. She was likable, but there wasn't exactly a characteristic about her that made her unforgettable. Story wise, even though this was a short read, I was expecting more from it. I felt that with all this darkness centering around this one house, there'd be more of a struggle. Like, this house is supposed to be this terrible and dark and creepy place where people are afraid to even be within a mile radius of it. And there was so much build up for the house throughout the book. I don't know about you, but even if this book is kind of on the light and fluffy side, if there's a haunted house that the characters go into, I expect it to be mind blowing and memorable. I would want it to be the highlight of the book, so when I think back on the book, that is what I remember most about it. Another thing is that I thought that the bows were neatly strung by the end of the book, leaving the story all squeaky clean and a little too bright for a supposedly dark tale. Once again, this book is supposed to be about a paranormal investigator. That's some creepy stuff right there. There was a whole lot of mystery and suspense, but at the very end, it was all neatly solved hastily and I almost expected rainbows and unicorns to start frolicking around. Don't get me wrong, I don't mind reading books that are short, but when things get resolved a little to neatly, even if the book is a standalone, it's off-putting for me. One thing I did like about this book? There was absolutely no romance for the MC. I sure do love my romance in books, but it's very rare to find a book that has absolutely zero romance. And for a teenager in real life, some kids, especially the social pariahs, do not have this epic love that not even the weight of the universe can stop. Doesn't happen. So when Violet did not hookup with some kid, and I wasn't even thinking about it in the book, I was happy about it. I think that a romance would not have fit in for this book and would only have made the romance insta-love-like if it was and the story would have been even fluffier. 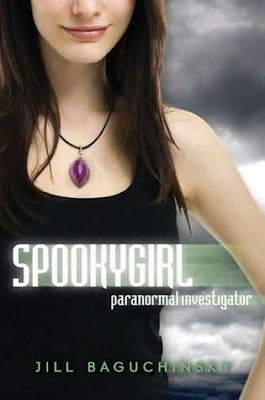 Spookygirl: Paranormal Investigator was a short and entertaining read about a girl who works to help ghosts find their peace and lives in a funeral home with her father and befriends to goths that join her in her investigations. It was morbidly funny and fast paced, always keeping me interested. If you're interested in a short, different, and paranormal read, Spookygirl: Paranormal Investigator could be a book you would want to read.